CSS Flexbox grid For Beginners – CSS is one of the first and easiest things to learn in web development and design, but don’t mistake its simplicity for lack of features. It has a number of amazing features and capabilities ready to be tapped into, one of them being its relatively new layout module: Flexbox properties. In the simplest terms, CSS Flexbox grid is a layout mode. CSS has a number of existing layout modes. The block layout mode (like display: block) has been around for a long while. Block layouts are a good choice to style full documents. In fact, a web browser treats several elements like divs and paragraphs as block level by default. Another common layout mode is inline. The strong tag, input tag, and anchor tag are examples of inline-level elements. Google Chrome’s developer tools even let you view an element’s ‘computed style’ to determine the CSS properties and values that have been applied to the elements not explicitly set by the developer. The relatively newer Flexbox properties (Flexible box) layout has been designed as a more efficient method of laying out, aligning and distributing space among container items, even if the size of these items is dynamic or unknown. Hence the term ‘flexible’. The concept behind Flexbox properties is to provide an ability to the container to automatically change the width, height, and order of its items to best fill up the space available. This can be really useful to accommodate items within different screen sizes and devices. Items are expanded to fill up any free space, or shrunk to avoid an overflow. The most important thing about Flexbox properties is that it is direction-agnostic. While the block layout is vertical-based and inline layout is horizontal-based, Flexbox is neither. Block and inline work well in the right situations, but lack the flexibility to support complicated or large applications, particularly when it comes to change orientation, stretching, shrinking, resizing and otherwise changing up the dimensions of the elements. Where are Flexbox properties used? Like any other CSS layout, Flexbox is best used in certain situations. In particular, it is appropriate for small-scale layouts and components of an application. For larger scale layouts, a Grid layout would be the wiser choice. A lot of developers and designers give preference to Flexbox properties whenever they can (sometimes too often!). This is because Flexbox properties are easier to use; the positioning of the elements is much simpler, so you can get more complex layouts with less coding. In other words, it makes the development process simpler. Now that you know a little bit about Flexbox properties and how and why it works, here is a detailed guide into the layout. The layout’s model is made up of a parent container, also called a ‘flex container’. The immediate children from this container are called ‘flex items’. 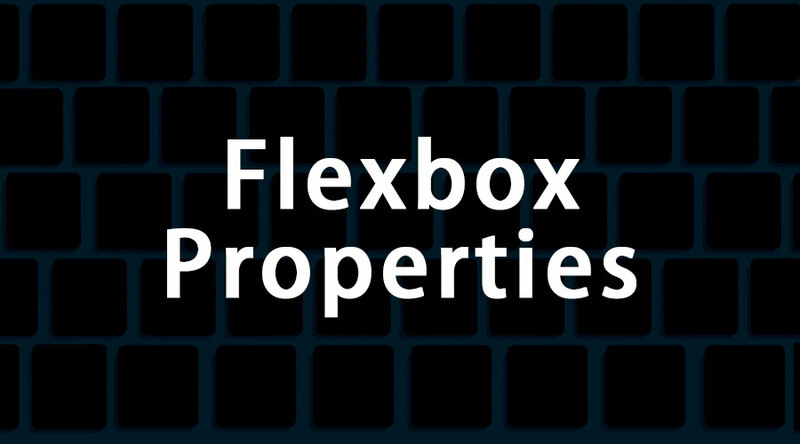 Flex: This is a combined shorthand for all of the above three properties: flex-grow, flex-basis, and flex-shrink. The default is ‘0 1 auto’. Justify-content: This order defines the main axis alignment and helps distribute the additional free space if there is any left when the items are inflexible or have reached their maximum size. This also helps control the alignment of the item when there is an overflow. You only require this property to set on the parent flex container and its immediate flex items. The container children will automatically become flex items. The flex-direction property can be laid out as columns vertically or rows horizontally. With row direction, the flex items are stacked left-to-right by default. Row-reverse changes this direction to right-to-left. The column direction is top-to-bottom by default, and the column-reverse function reverses this to a bottom-to-top direction. The flex-wrap property controls if the flex container’s children are laid out in multiple or single lines, and the direction in which the new lines are stacked. The nowrap value sees flex items displayed in a single row, shrunk to fit the width of the container by default. The wrap value sees flex items displayed in different rows in a left-to-right or top-to-bottom direction. You could add wrap-reverse to change the order too. The default value is nowrap. The justify-content property has four values: flex-start to align items to the left side of the container; flex-end to align items to the right side; center to align with the center; space-between to align items with equal spacing between them, with the first and last items aligned to the container edges; and space-around for aligning the flex item with equal spacing around them, including the first and last items. Flex-start is the default value. This property has five values: stretch to scale up flex items to fill the whole width or height from cross start to cross end of the container; flex-start to stack items at the cross start; flex-end to stack items at the cross end; center to align items to the center of the cross axis; and baseline to align items so that their baselines are aligned. Stretch is the default value. This property aligns the lines of a flex container when there is additional space in the cross axis. Its values are: stretch to distribute space after every row; flex-start to stack items towards the cross start; flex-end to stack items towards the cross-end; center to stack items at the center of the cross axis; space-around to equally distribute space around flex items. The default value is stretch. This property controls the order of appearance of the flex container’s children. They are ordered within the flex container by default. You can reorder flex items without having to restructure the HTML code. The default value is zero. This property enables the default alignment of a specific flex item to be overridden. You can use the values from align-items for this property. The auto value in align-self is computed by the value of the align-items on the element parent. If the element has no parent, the stretch is used instead. This is an example of perfect centering. The height and width values can be changed as you wish. The key here is to set the margin to ‘auto’ so that the flex container automatically absorbs any extra space. Simple enough! Now, let’s move on to adding some more properties: a list with six items of fixed dimensions that can be auto-sizable. They have to be evenly distributed to the horizontal axis. Next, let’s try to center a right-aligned navigation for medium-sized screens, and to make it single-columned on small devices. Time to take this one step further! Let’s try a mobile-first layout with three columns, with a full-width footer and header and independent from source order. These are just some basic examples. You can play around a lot more with CSS Flexbox grid layouts, and they are absolutely invaluable if you want to make a responsive webpage. So here are some articles that will help to get the more detail about the flexbox properties, flexbox code and also about the css flexbox grid so just go through the link which is given is given below.